Côte d'Azur or the French Riviera - Nice, Cannes, St. Tropez! 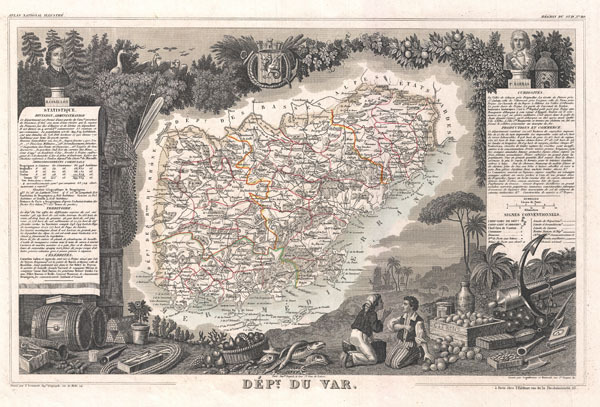 This is a fascinating 1852 map of the French department of Var, the heart of the French Riviera or Côte d'Azur. Includes the resort cities of Cannes, Nice and San Tropez, among many others. This area also houses a number of vineyards. Here you will find the AOC Coteaux varois en Provence, which produces a wide variety of reds and whites. The red wines principally use the grenache, cinsaut, mourvèdre and syrah grapes. White wines use the clairette, grenache blanc, rolle blanc, Sémillon Blanc, and Ugni Blanc. The map proper is surrounded by elaborate decorative engravings designed to illustrate both the natural beauty and trade richness of the land. There is a short textual history of the regions depicted on both the left and right sides of the map. Published by V. Levasseur in the 1852 edition of his Atlas National de la France Illustree.